This is a no nonsense guide to finding yourself and either rediscovering the passion in your relationship and making it flourish or realising it is time to move on and leave with love and integrity. In short you will find the purpose and happiness you have been craving. Author, Gina Mitchell is the founder of Positive Life Shift. She has successfully helped people from Australia and around the world with their relationships and their lives in general since 2012. Gina uses simple and effective strategies to help people overcome issues in their lives, particularly in their relationships. Gina has always had a passion for helping people and that is why she undertook the NLP training and life coaching courses. She also completed an Honours degree in Biochemistry and teaching diploma in the 1980s. Gina brings to the table the logic of her science experience along with her real life skills in science teaching, backed up with her NLP qualifications. This is a unique combination of skills for a relationship facilitator. Don't forget to register your book to receive the interactive chapter by chapter videos and workbooks. This concise book offers an abundance of practical tips and ideas. Gina offers the reader some excellent strategies on how to treat and love your spouse or partner. She teaches us to be mindful of our own and our partners communication styles as well as becoming more aware of our values and needs in a relationship.The bonus links to worksheets make the work very personal and kick starts the process of looking closely at our relationships and putting Gina's strategies into practice. Thank you Gina for the gentle reminders on things that I can actually do to enhance my relationship with my wife and reignite the spark, romance and passion from our early days of getting to know one another. Loved it! A refreshingly easy and practical read - so practical that my husband and I read it together. As conversation starters, the case studies helped a lot.and we plan to continue out chats over the holidays. Gina is obviously well informed about relationship issues. 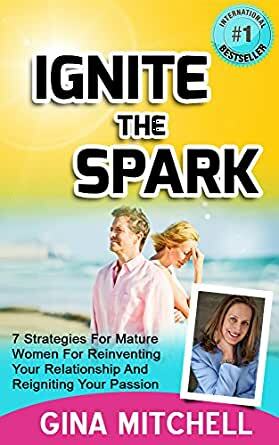 After recently leaving a 33 year marriage I've finally discovered in this book some common sense advice on relationships and practical strategies to overcome relationship issues as they arise. I can't wait to use some of these strategies in my new relationship. Interesting reading about ways to improve my relationship. Finally some common sense advice on how to have a great relationship. Gina is obviously well informed about relationship issues. Practical advice that are easy to understand and apply. Gina speaks to mature woman but her advice could be applied to anyone in a relationship.